Whether you celebrate Valentines Day or not, we can all be forgiven for wanting to treat ourselves and indulge a little, everyone deserves it. Taking some ‘me-time’ can have a strong positive impact on our personal well-being and can aid in reflection of some of the situations we face everyday or unexpectedly. Here at Developmentplus, we feel that taking some ‘me-time’ can give you the resources to take time out of the stresses and strains of life while allowing the development of new interests and hobbies. 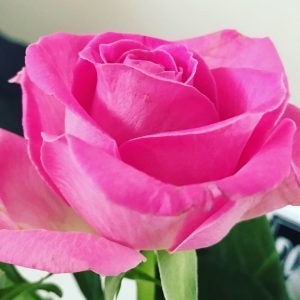 With the smell of roses wafting through Queens Park Community Hub, the warm approach to building interests can open our eyes to something completely different; our ‘All Things Rose’ workshop allows people to try something new, to immerse themselves in the scents and aromas and use roses as a way of increasing self-care. 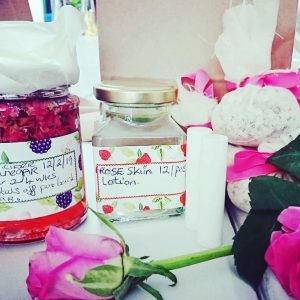 People come along to a warm and friendly setting where they work with Hannah to create a variety of different remedies and treats using roses as a herbal alternative in a chemical heavy world. Tuesday 12th February saw our first workshop taking place and the first thing to note was our new location. Developmentplus recently took on another room next door at the Hub which allows us to put on courses and workshops in a more appropriate setting to the needs and wants of our participants. With lots of natural light filling the room and enough space for up to 12 people, it’s ideal for our needs. The session itself was a great success and we gained some good valuable feedback from all.